All asphalt shingle manufacturers’ warranties become void if an attic is not properly vented. 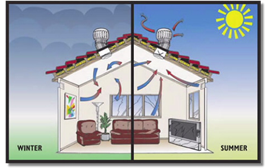 A balanced attic ventilation system will reduce your utility costs and lengthen the life of your roof and HVAC system. Proper attic ventilation can prevent mold and mildew and other temperature and moisture related problems. One of the most important things for any homeowner to consider is proper attic ventilation. We find that very few homes have proper ventilation. They are usually under-vented and almost always not in balance (providing appropriate amount of roof top exhaust equal to air intake). This is most critical during the high temperature months of the year. Attic ventilation is often overlooked by DFW roofing contractors because most do not understand the the dynamics of air movement and are untrained in knowing how to fix an unbalanced system. Our staff is technically trained to specify the right system for each home or building and to install it properly. Attic ventilation might seem like a minor consideration, but when properly installed, it allows your home to breathe, saving you hundreds of dollars in repair costs. During warmer months, ventilation helps keep attics cool. 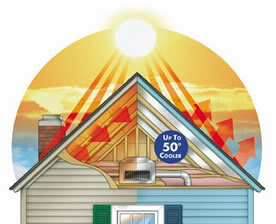 It helps prevent hot, dry summer air from delaminating the roof sheathing. It also stops shingles from deteriorating prematurely. What’s more, fresh air in the attic makes a home much easier to cool, which can result in lower energy costs. In winter months, ventilation helps reduce moisture to keep attics dry. It stops water from backing up under shingles, damaging insulation, and rotting the roof structure itself. It also helps prevent ice dams from forming. Ice dams occur in areas where snowfall and cold temperatures are common and pose a special problem because they prevent melt water from running off the roof. They can even cause leaks inside your home, resulting in drywall damage. Radiant barriers are materials that are installed in buildings to reduce summer heat gain and winter heat loss, and hence to reduce building heating and cooling energy usage. The benefit of attic radiant barriers is primarily in reducing air-conditioning cooling loads in warm or hot climates. Arrington installs radiant barrier shields, not coatings. Do not be misled by other contractors out there selling a radiant barrier product that is only a radiation control coating. There is a significant difference. Their product is simply a “paint” that is rolled or sprayed on, but does not deliver the same level of protection as a radiant barrier. At Arrington, we only use radiant barriers made of aluminum which are installed to the underside of the roof rafters. We use a dual layer reinforced foil, which reflects 97% of radiant energy. We install the foil to the underside of the rafters for maximum efficiency. This method allows for an air space, through which we pull cooler fresh air and exhaust the heated air through properly sized attic exhaust vents. The radiant barrier essentially allows us to isolate the heated air away from the main attic space and then to remove it totally from the attic system, rather than have it trapped in a feedback loop between the deck and radiant barrier. Proper installation of a radiant barrier in coordination with the insulation and the attic ventilation is critical, especially in the harsh climates of Dallas, Ft. Worth and North Texas. All these systems work together if properly installed. If these systems are not coordinated properly, they are much less efficient.